Dockins Graphics started in July of 1994 and was purchased and became an operating subsidiary of Pathway Press September of 2012. Pathway Press was started over 100 years ago as the publishing arm of the Church of God. The Printing Division was formed shortly after to support the ministry of the church and their needs. Dockins Graphics as you see it today was spun off as a stand alone printing/publishing business. We are now operated in the original facility at 1705 Overhead Bridge Road in Cleveland Tennessee. Here is a brief timeline of how Dockins Graphics became the company you now see. In July of1994 we started business in basement of Bicycle Shop with 2 small presses and 3 employees. January 1995 saw us move to 4000 sq. ft. building, add additional presses and 4 more employees. In 1996 we moved to 6000 sq. ft. building to accommodate additional equipment and increased sales and also added 40” 4-color press. Employees reach 15. July, 2000 we purchased our current building and added square footage to total 10,000. Added 40” 2-color press, 28” 4-color press and 8-pocket stitcher trimmer. 2001 Film processing ceased. Purchased direct-to-plate equipment and added multiple shifts. 2005 was the year a satellite operation was purchased in Etowah, TN. This facility was subsequently purchased by Helen Mullins after she managed it for multiple years for Dockins Graphics. 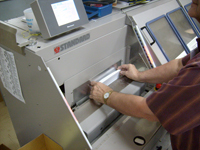 2005 - Pathway Press starts a full digital operation to suit quick turnaround on book/magazine and commercial customers. 2009 - Pathway Printing adds its 4th Digital Production Press. 2010 we add a second perfect binder increasing our book binding capability to over 1200 per hour. 2012- Dockins Graphics Inc. becomes an operating unit of Pathway Press. 2014- The Printing Division of Pathway Press moves to the facility on Overhead Bridge Road. Combining the Full Digital Production capabilities of Pathway Digital in a single unit. We now offer our partners the strength of a myriad of production choices from On Demand digital color and book production to High Quality/High Volume Offset production. We have an equipment investment of well over $2m to serve you and your needs. Thank you for giving us the opportunity to serve you, it's what we are here to do..